It's grey and dreary outside. I do not mind when it's cold. I do not mind when it's snowy. I do not mind when it pours with rain but when nature decides to go on strike and only give out diffused light I become restless. To cheer myself up I thought I would cook a colourful lunch with a recipe from our book 'Lentil: Traditional and Contemporary Recipes from the Mediterranean'. 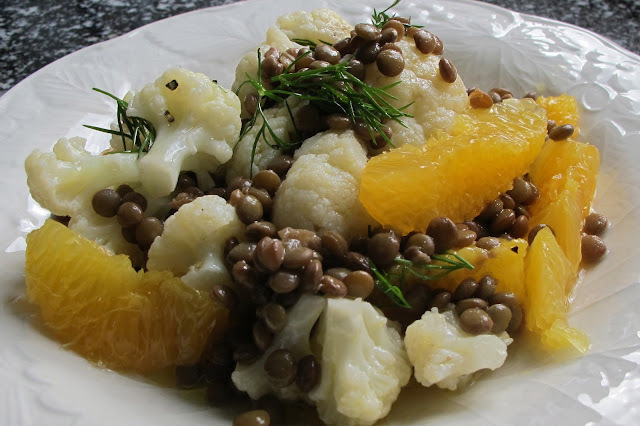 This lentil salad combines, oranges with cauliflower florets and brings a touch of colour to the table. My friend Shermine, a dietician, assures me that there are many nutritional advantages to this dish. Lentils are high in protein and iron, oranges in vitamin C and cauliflower delivers fibre, more vitamin C and potassium. So there you have it, it's not just a pretty face. Rinse and strain the lentils. Place them in a deep pan with the bay leaf and vegetables. Cover with cold water and bring to the boil. Cook for 40 minutes. Drain and discard both bay leaf and vegetables. Keep warm. Meanwhile, in a separate saucepan, bring 2 litres of water to the boil. Add 1 tablespoon of salt and blanch the cauliflower florets for 5 minutes. Drain the water and keep warm. With a sharp pairing knife, carefully skin the oranges removing all the pith. Delicately cut through each segment leaving the membranes attached and flesh free. Arrange the oranges on a serving dish. Now prepare the dressing by mixing together, lemon juice, salt, a pinch of black pepper, dill and 3 tablespoons of olive oil. 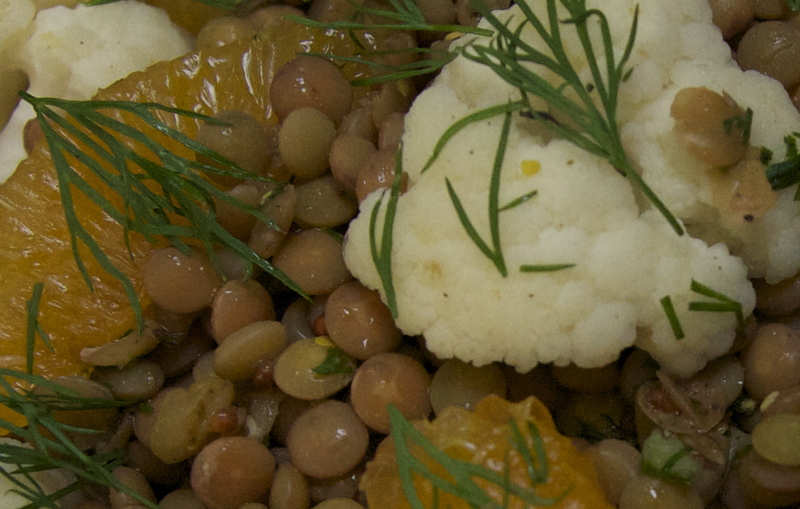 Dress the cauliflower florets and lentils. While still warm. Toss and arrange them over the orange segments. Delicately lace the salad with the remaining dressing.